- Move the shift lever to and set the parking brake. Turn off all accessories and turn on the hazard warning lights. 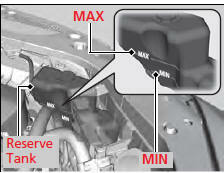 Always let the engine and radiator cool Reserve down before removing the radiator cap.